We will call you back!For a quick call back, fill out your details below & we will be in touch. Our Technicians have decades of experience repairing washers and dryers in Brisbane. Don't let an issue with your washing machine create chaos at home. If your washing machine or dryer is causing concern, don't panic, pick up the phone and organise for one of our highly qualified servicemen to visit or you can drop it at our workshop for repairs. We run a special whitegoods workshop service here at our Hamilton premises. If it is convenient for you to drop it to us, it may be more economic for you. Spare parts? We stock or can get for you a huge range of parts for all the major brands. With nearly 50 years servicing Brisbane's appliances, and our high caliber of advice, our vastly experienced technicians can be relied on to sort out even the most daunting of problems. We take pride in our prompt washing machine repair service to a big range of washers across most popular brands. With nearly 50 years servicing Brisbane's appliances, and our high caliber of advice, our vastly experienced technicians can be relied on to sort out even the most daunting of problems. They have a wide knowledge of a huge range of washers and dryers and are experienced in fixing all the major brands. Whether it is a front loader or a top loader, a dryer or even a washer/dryer combo, call us and we will help with the most appropriate course of action. If your machine is beyond repair, we offer a replacement service whereby we offer new and fully serviced machines, delivery and installation, and we will take away your old machine. THE MAJORITY OF MACHINES CAN BE FIXED ON THE SPOT! No matter what the problem is with your washer you’ll find advice, washing machine parts, repair or replacement at Albion Appliance Service. Get in touch with us for all your dishwasher, fridge repairs, oven repairs, stove and cooktop and our technicians will come to you. Albion, Alderley, Annerley, Arana Hills, Ascot, Ashgrove, Aspley, Auchenflower, Bald Hills, Balmoral, Banyo, Bardon, Boondall, Bowen Hills, Bracken Ridge, Brendale, Bridgeman Downs, Brighton, Bulimba, Carseldine,Chermside, Chermside West, Clayfield, Clontarf, Coorparoo, Deagon, Eagle Farm, East Brisbane, Enoggera, Everton Park, Everton Hills, Ferny Grove, Ferny Hills, Fitzgibbon, Fortitude Valley, Gaythorne, Geebung, Gordon Park, Grange, Hamilton, Hawthorne, Hendra, Herston, Highgate Hill, Holland Park, Indooroopilly, Jindalee, Kangaroo Point, Kedron, Kelvin Grove, Keperra, Lutwyche, McDowall, Milton, Mitchelton, Moorooka, Morningside, New Farm, Newmarket, Newstead, Norman Park, Northgate, Northlakes, Northside, Nudgee, Nundah, Paddington, Red Hill, Redcliffe, Sandgate, Seventeen Mile Rocks, Shorncliffe,, South Brisbane, Spring Hill, St Lucia, Stafford, Stafford Heights, Taigum Teneriffe, The Gap, Toowong, Virginia, Wavell Heights, West End, Wilston, Windsor, Woolloongabba, Wooloowin, Zillmere. However the tenants were having problems doing fitting the parts and after phone calls and some emails we finally went out to inspect, to find the rails were too worn to support the tray properly. On enquiry to the manufacturer we found the rails were no longer available, leaving the customer with a set of rail stoppers they didn’t need any longer as the dishwasher had to be scrapped. It would have been cheaper to have us come out in the first place, which would have avoided problems with the tenants. If you have any doubts, give us a call to discuss. We will give you our honest advice about whether your machine is worth inspecting based on decades of experience. 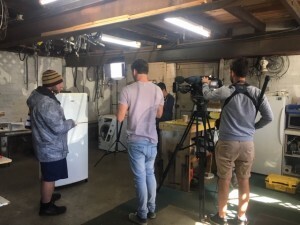 In July 2018 we were pleased to provide the technical and acting skills of Andy our refrigeration technician for a segment filmed for ‘SCOPE’ entitled ‘Trade Science’ on Channel 11. SCOPE is a children’s science show, aimed at explaining in straightforward language various extraordinary processes. In the segment, Andy explains the science behind refrigeration. We understand the segment will be only part of one program, possibly 10-15 minutes, but to do the filming took four hours. Luckily it was July as he was required to wear his antarctic gear.